Kwanzaa is a non-religious, African-American holiday that celebrates family, community and culture. It was established in 1966 by Dr. Maulana Karenga to encourage African Americans to learn about their customs and history. The name Kwanzaa comes from the Swahili word Kwanza which means "first fruits." Celebrated each year from December 26 through January 1, it focuses on seven principles called Nguzo Saba (en-GOO-zoh SAH-bah). 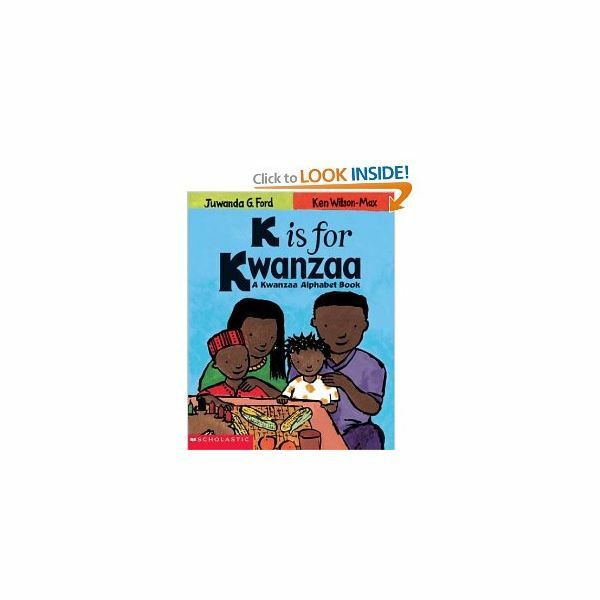 Begin by showing the class the cover of the book K is for Kwanzaa. Ask the children if they have heard of Kwanzaa and what they know about it. Explain that it is a special holiday celebrated by many African Americans the last week of December. Read the first page, which offers a brief introduction to the holiday, to the class. Stop and ask the children to name some of the important information about Kwanzaa that they learned and list the items on you chart paper. Read the next page which explains the seven principles of Kwanzaa. Discuss each one briefly. Continue to read the story, stopping every few pages to add facts to your chart. When you have finished, give each child a copy of the small book, Symbols of Kwanzaa. Look at the cover together. Have each child write his name on the cover and then color the rectangle on the cover in black, red and green stripes to match the Kwanzaa flag. Look over each page with the class and discuss the symbol. If you have pictures or examples of any of the symbols, show them to the class. You might want to go back and read the page from K is for Kwanzaa where it is discussed. Here is a list of each symbol and where it can be found in the book. After discussing each of the symbols, have the students illustrate and color their books. Assess the children's learning by giving the students pieces of white paper and having them fold the paper into four sections. Then tell the students to draw and write about one symbol of Kwanzaa in each section. Here are a few fun ways to help your students continue to learn about Kwanzaa. Make a Venn diagram comparing Kwanzaa to another winter holiday you have studied, such as Christmas or Hanukkah. Have the children participate in other Kwanzaa activities, like making a Kwanzaa flag, learning a song about Kwanzaa and preparing Kwanzaa fruit kabobs. Read more books about the holiday to enhance the children's knowledge. Here are a few more books about Kwanzaa that your students will enjoy. A young child celebrates Kwanzaa with his family by dressing in African clothes, eating special food that Grandma brings, lighting the candles on the kinara and more. This original folktale will introduce the children to the seven principles of Kwanzaa. It tells the story of seven brothers, who are ordered by their father to make gold from silk thread by sundown without fighting. The values of Kwanzaa are incorporated into the story, as the brothers work together to complete the task. Bold, colorful illustrations and simple text explain the customs and origins of the African-American holiday. Each day's rituals are described from a child's point of view. This is another informative book about Kwanza and could be used in the lesson plan if K is for Kwanzaa was unavailable. It is always important to include some multicultural lessons and activities around the holiday season. Adding a Kwanzaa lesson as well as some great Kwanzaa read alouds to your winter holiday unit will ensure that all children feel included.